Inside an American Thanksgiving Jump to media player Matt Danzico and Benjamin Zand of BBC Pop Up spend the holiday at the Danzico residence to investigate how Americans spend Thanksgiving. Pennsylvania bashing Jump to media player The "ugliest accent in America". Hog tide Jump to media player Wild pigs running amok - what to do? Conflict Kitchen is an art project based in the centre of Pittsburgh which serves food from countries with which the US is "in conflict". The founders get to define what conflict means - it can range from outright war to economic sanctions - and since opening in 2010 they have prepared food from Afghanistan, Iran, North Korea, Venezuela and Cuba. 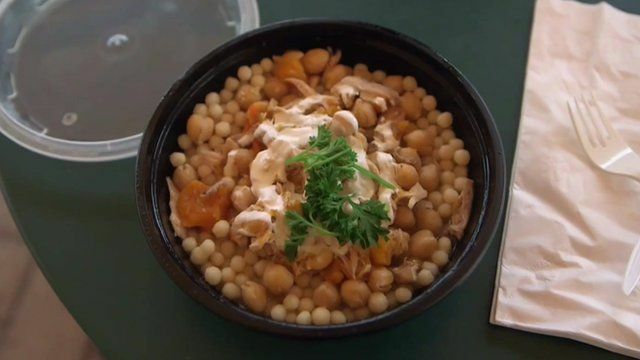 But the restaurant's latest choice of cuisine, Palestinian food, has caused controversy in the city and even led to a death threat which temporarily closed the venue. Critics pointed out that the US is not in conflict with the Palestinian people. They claimed that the pamphlets served with the dishes included "anti-Israel" propaganda. But Conflict Kitchen's founders said the project was designed to encourage debate among Americans. The BBC Pop Up team has spent November in Pittsburgh and Benjamin Zand has been following the story.